" I've ordered from this company many times....very pleased with everything." This 6-week Fireproof Your Marriage study uses exclusive video clips from Fireproof along with thought-provoking discussion questions, and individual and couples' Love Dare devotionals to challenge members to grow deeper spiritually and in their relationship. 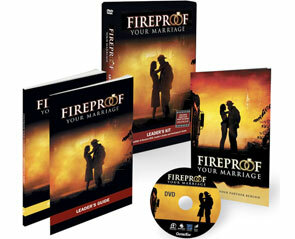 Fireproof Your Marriage will challenge couples to love better, to love first and to love for a lifetime! Small group study guides and curriculum kits. Great to connect visitors with your small groups or Sunday school classes. Small Group Curriculum for Sunday School or mid-week services. Can be used to coordinate with sermon series. Perfect for small group bible studies. Seeker friendly style is great for new believers and growth groups.